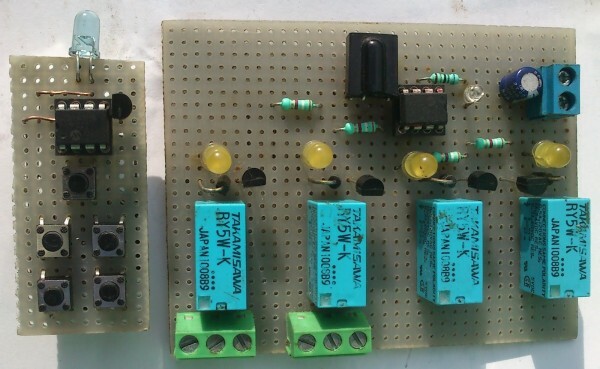 This little project will demonstrate how you can build NEC protocol based Infrared Remote Control to use with various NEC Protocol IR receivers. actually there are lots of projects out there to accomplish this task but i have to write my own code because of too many requests on this IR(infrared) Remote Control Relay Board with PIC 12F675 Microcontroller people keep asking “Where is the Transmitter for this” although you can use any NEC protocol based remote ,but i just wanted to build one by my self. so here it is. Visit Gaurav’s website for project details. This entry was posted on Thursday, October 3rd, 2013 at 11:51 am	and is filed under infrared. You can follow any responses to this entry through the RSS 2.0 feed. You can skip to the end and leave a response. Pinging is currently not allowed. Thanks for the project & your response to many questions asked by people. I have gone through all those and very much appreciate your patience. I need your help, if you please.It is here….. I constructed one ir remote control for FAN on/off & its speed whose HEX file of the RECEIVER only was available in the net. This author suggested to use CAR MP3 player remote control as hand set. Entire unit is working fine. Receiver is with 12f675. Now I want to make the transmitter part. Kindly provide me the codes. i am using the same protocol but with pic16f877a. what are the changes i have to make in the program? i am using mp lab ide(high tec c compiler). i haven’t any predefined header files. i have to define all functions in my program. please help me…..